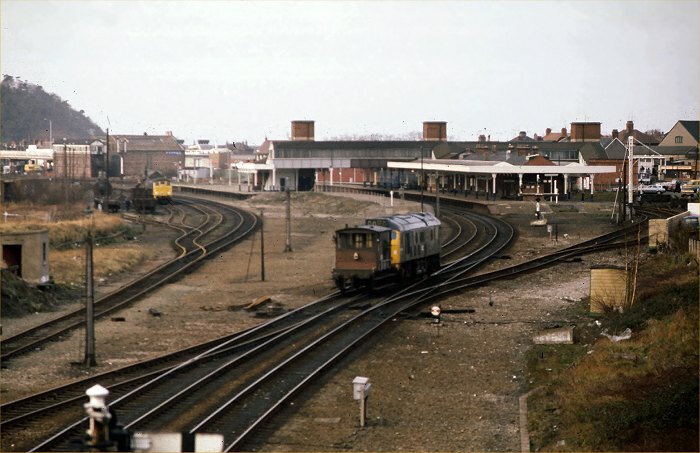 The first working day of the new year, 1978, and two of the daily freight trip workings are seen at Llandudno Junction. 24133 returns from the trip to Blaenau Ffestiniog with just a brake van, and crosses over into platform 2 so that the single line token from Llanrwst can be handed into the station office. It will then proceed into the yard. In the yard, 24081 has returned with the trip working to Valley and Holyhead, with one empty fuel tank from Holyhead depot. The low levels of traffic on these workings were not typical for 1978, but a result of the preceding holiday weekend. The two trips to Amlwch on this day were heavily loaded, and the morning trip from Amlwch was worked through to Mold Jcn so that 24082 could pick up another trainload for the afternoon trip. The Amlwch workings were frequently altered before and after holiday periods to allow for continuing production at Associated Octel when the trains weren't running. The '1970s' track layout at the Junction can be seen, with the connection from the Blaenau branch joining from the left. As can be seen, there was no access to the Blaenau branch from Platform 1 at this time. A more flexible arrangement was introduced with resignalling at the start of the 1980s when the branch connection was moved further away from the station.